The use of android smartphone apps is increasing in every area of work and life. With the vast selection of labs and tests that are available in medicine today, it can be hard to remember the reference values for every test. Hence, laboratory professionals are also increasingly turning to some apps for quick access to information. So what smartphone apps are good to use? 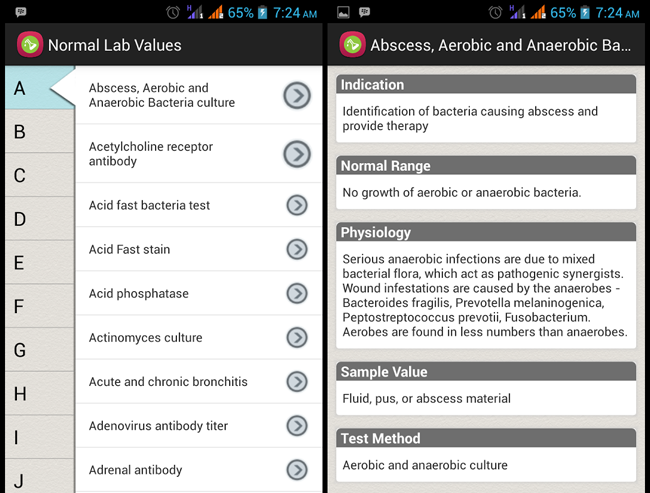 Here, I recommend following free android apps for laboratory professionals which can be used as reference for lab test values and other information. 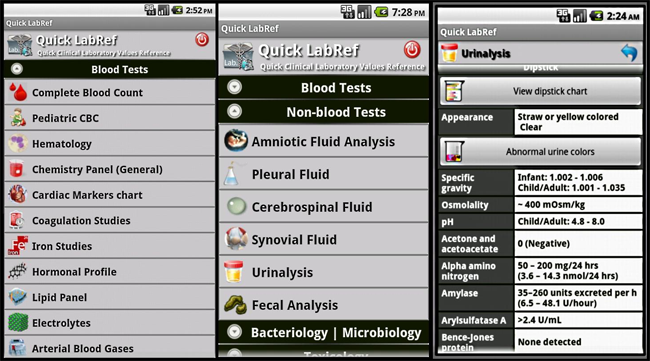 Quick LabRef for Android from Nika Informatics is one of the best laboratory reference app among clinical laboratory professionals. It provides quick look at the up-to-date information on the most commonly used clinical laboratory values and other useful relevant informations. 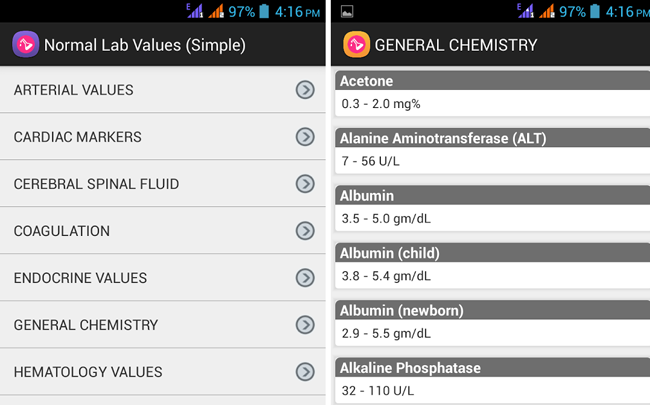 Upon launching the app, you are presented with a list of categories including Blood tests, Non-blood tests, microbiology, toxicology, genetics, pathophysiology and miscellaneous. Within each category are the specific tests where you can find values and information. Normal values reference are provided in both Conventional Units (CU) and, whenever available, in units of the “Sistème International” (SI). Dorland’s Medical Dictionary contains approximately 40,000 entries and 350 illustrations to provide authoritative, concise definitions for a wide range of terms used in the health sciences. Lab personnels can use it as an useful tool to improve theoritical knowledge and concepts towards important medical terminologies. Both online and offline modes supported, the offline mode allows you to download the whole dictionary and work independently from data connections. Normal Lab Values Reference packs in all the most commonly used clinical laboratory values and other useful relevant informations needed for quick reference in clinical laboratory. Test values are categorized into different categories such as Biochemistry Test, Haematology Test, Immunology Test, Serology Test, Microbiology Test, Molecular Test Detection, Hormone Test, Sputum Test and etc. Normal Lab Values gives both non-medical readers and health professionals a fast-navigable and clearly structured overview of the main routine laboratory parameters and possible causes of their increase and decrease. Each lab contains important clinical information, critical lab values, differential diagnoses and etc. The Normal Lab Values are clearly arranged, alphabetically ordered and quickly located. The above is a List of few free android applications that I’m using and found better than others. What about you guys? Which applications do you use for the same purpose? If you are using any better and useful apps, please use the comment form below to write about it. I’ll be happy to update the list with more valuable apps.